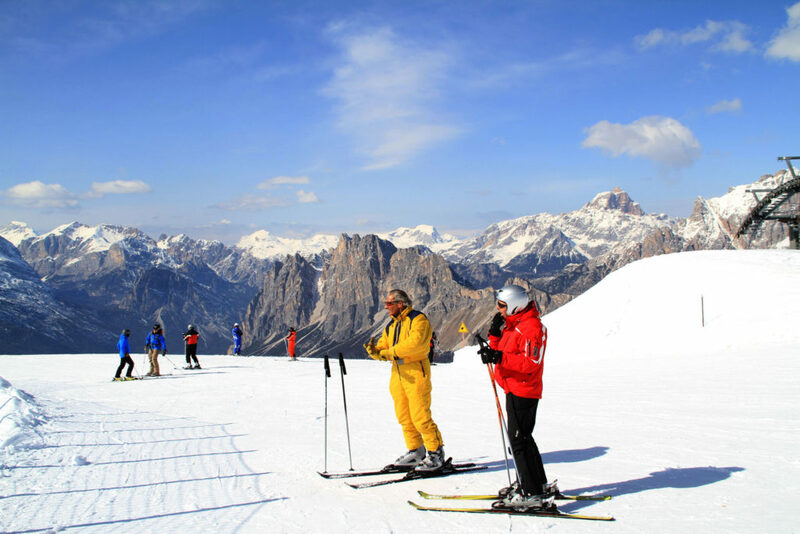 Cortina d’Ampezzo is the most beautiful ski region in the Dolomites of Italy, certainly the most stylish and special village. Cortina has a proud heritage – hosting the 1956 Olympics. 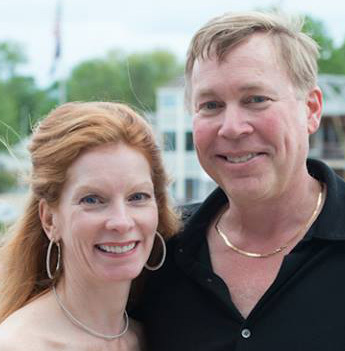 But for your ski vacation, its about luxury hotels, and leisure strolls in the old village at après ski. 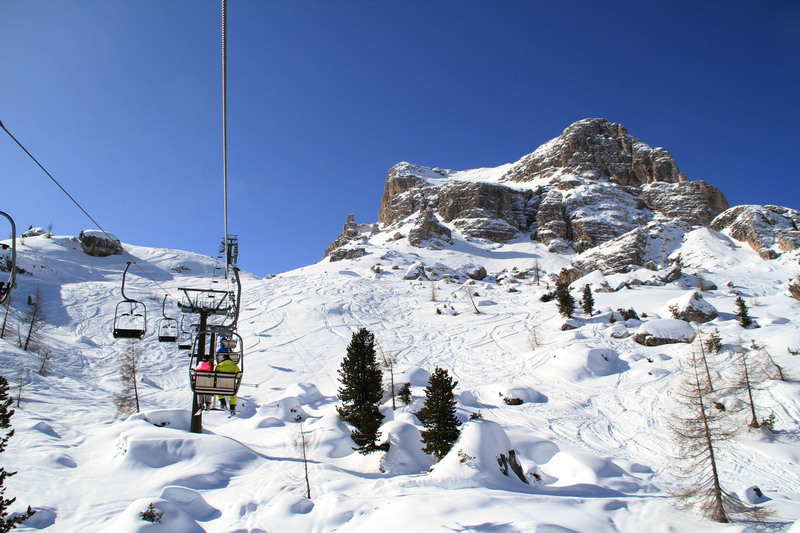 Cortina is actually comprise three ski resorts, and as a bonus its part off the vast Dolomiti Superski collection– the biggest ski network in the world with 1,200 kilometers of skiing in 12 unique regions all on one lift ticket (but not all connected). 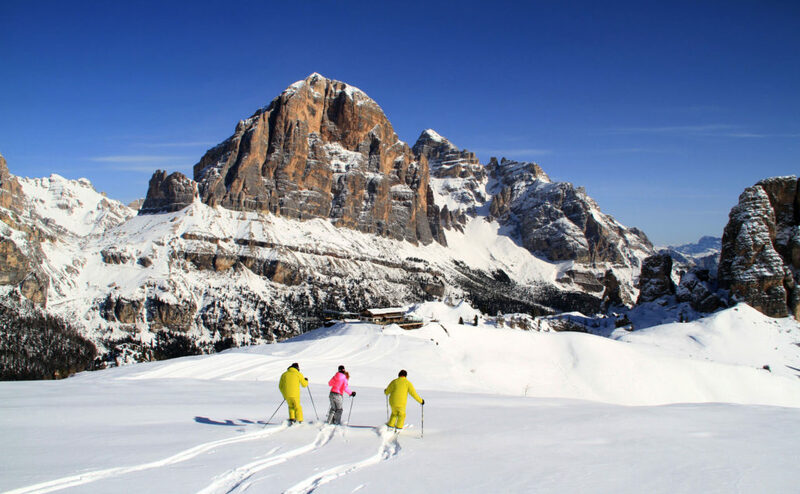 Since Cortina is not connected by lifts to the rest of the Dolomite ski region, its perhaps more exclusive. 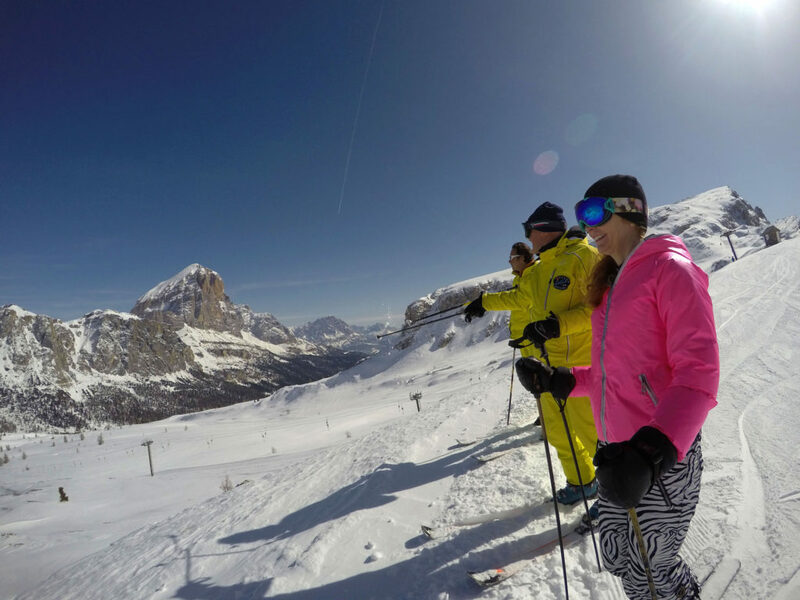 Cortina is certainly more stylish, with some of the top ski hotels in Italy. 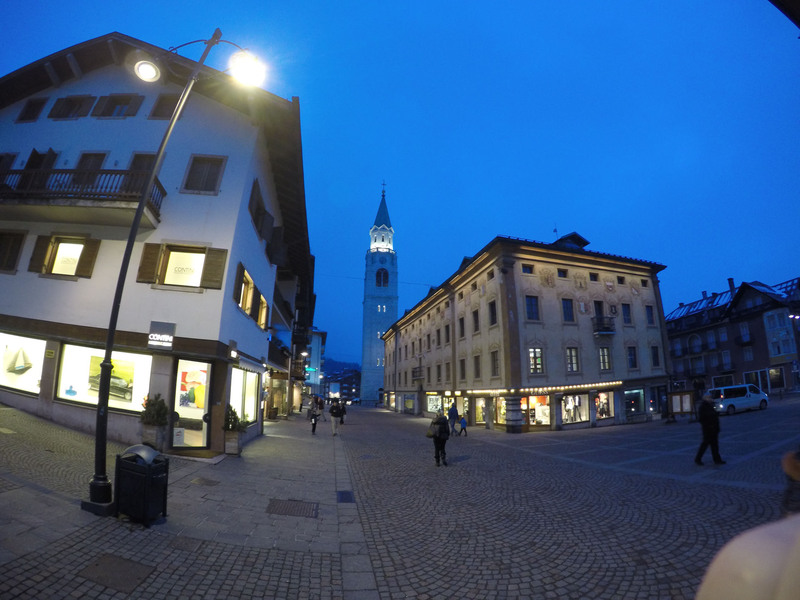 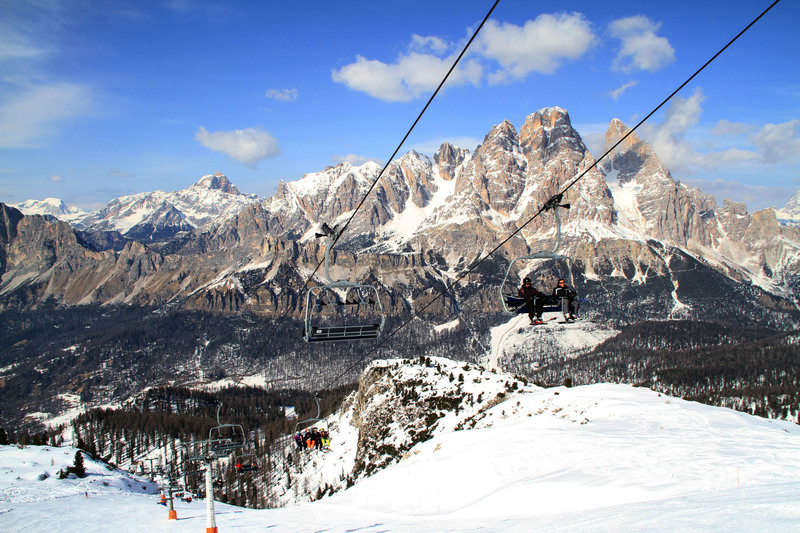 Cortina is a delightful ski town in the Ampezzo Valley, just two hours from Venice. It’s a gorgeous valley surrounded by dramatic towering Dolomites, spectacular like Zermatt Switzerland. 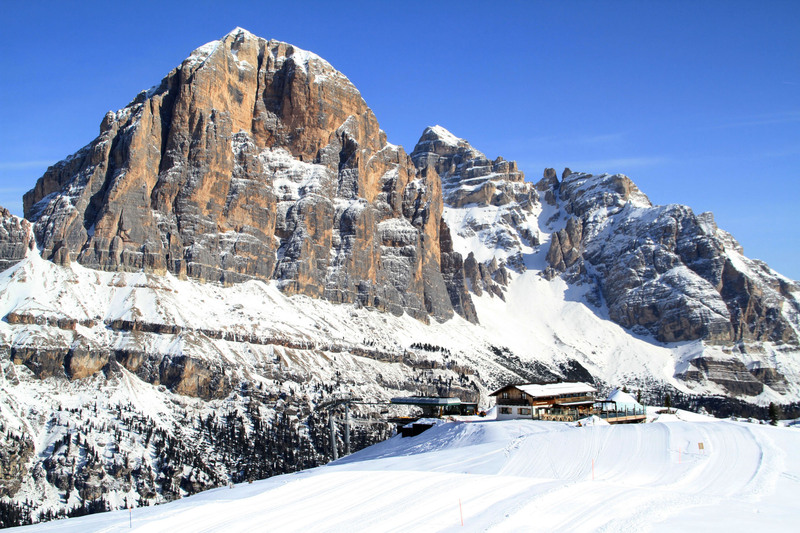 The Dolomites are not as high as the French or Swiss Alps, but they are very scenic with steep jagged rock cliffs in red and silver limestone (Dolomite) hues. 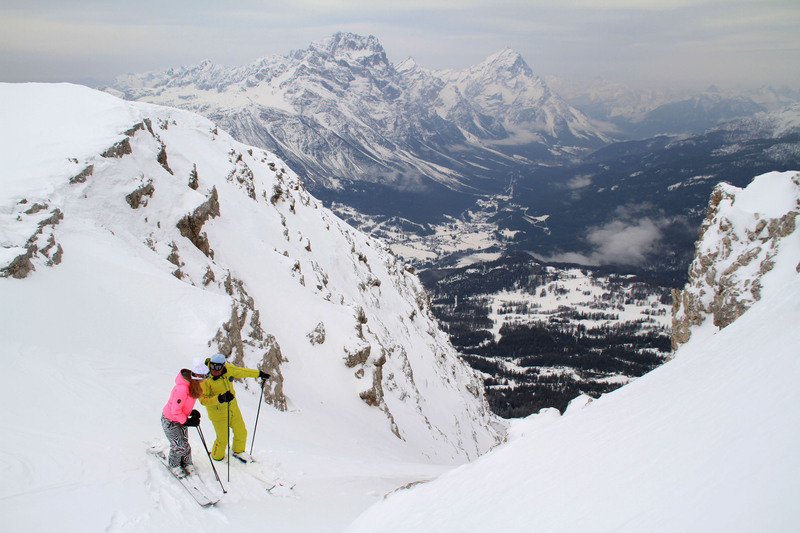 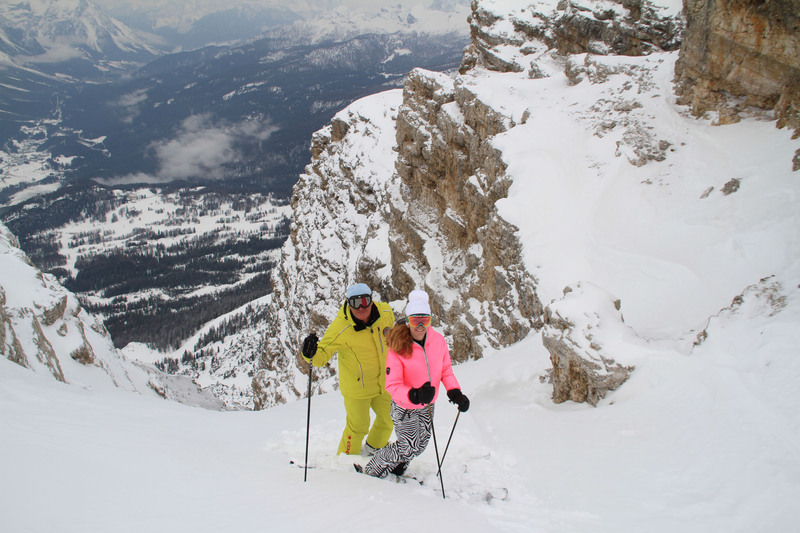 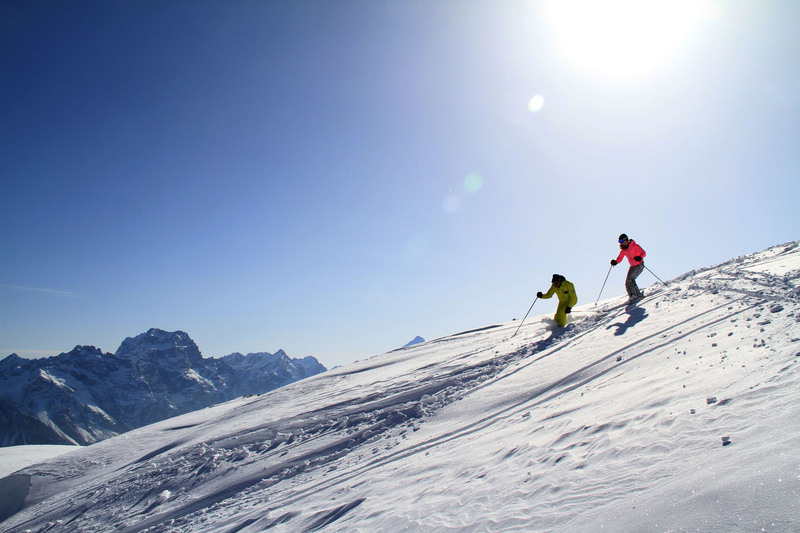 What we love about Cortina is the lifestyle of skiing. 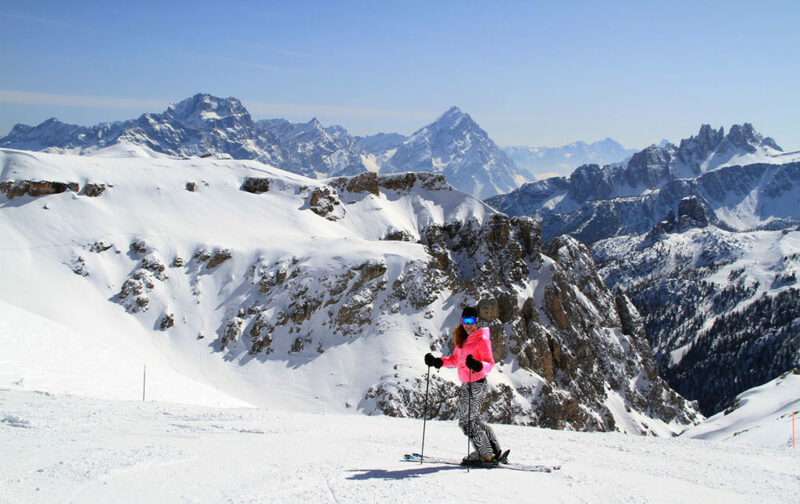 Italians show up late to the ski slopes, fashionably dressed, take a few runs then head to a fabulous sun deck for lunch, drinks and Far Niente, then ski down to the village for another outfit change, and the après ski passagiata in Cortina’s cobblestone piazza. 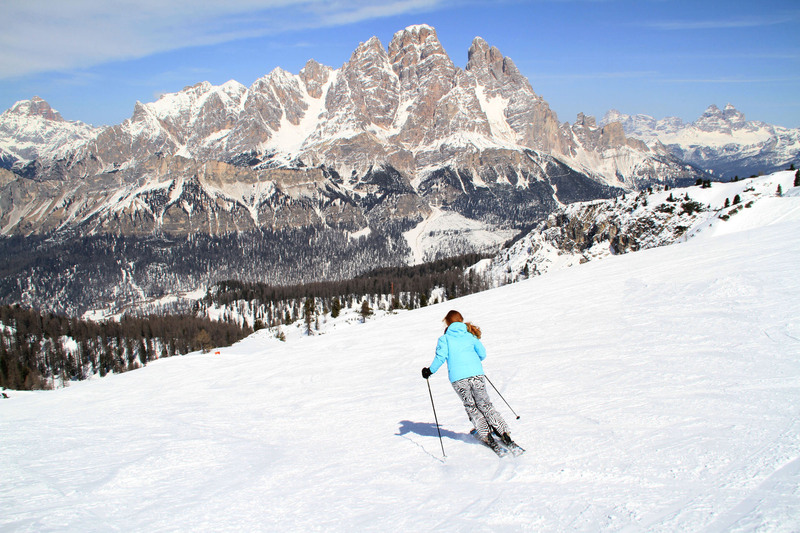 So if you are an adventurous skier, you can get lots of skiing in while the Italians enjoy their more leisurely Dolce Vita pace. Cortina’s’ three ski regions are Monte Faloria and Monte Cristallo on the northern side of town, Tofano south, and Cinque Torri – named for the five towering peaks on the sunny south side. 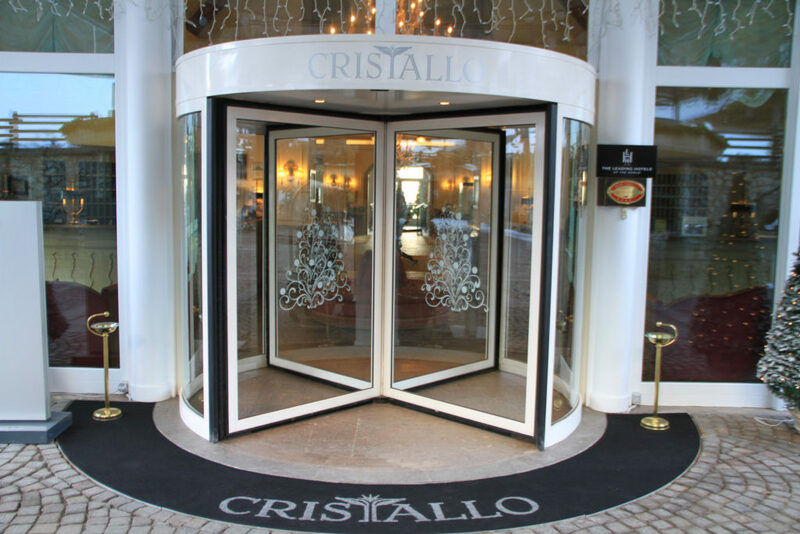 We recommend you stay at Hotel Cristallo in Cortina, and ski then all on different days for the ultimate luxury Cortina ski vacation. 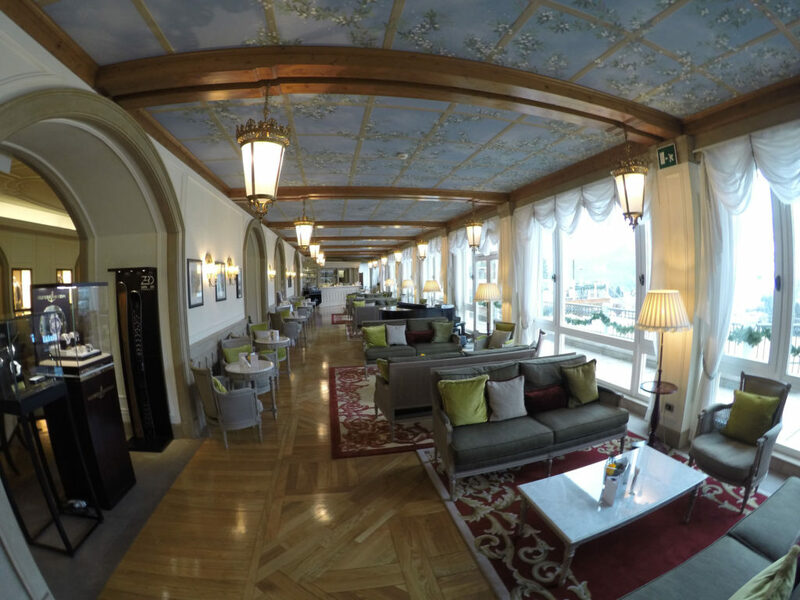 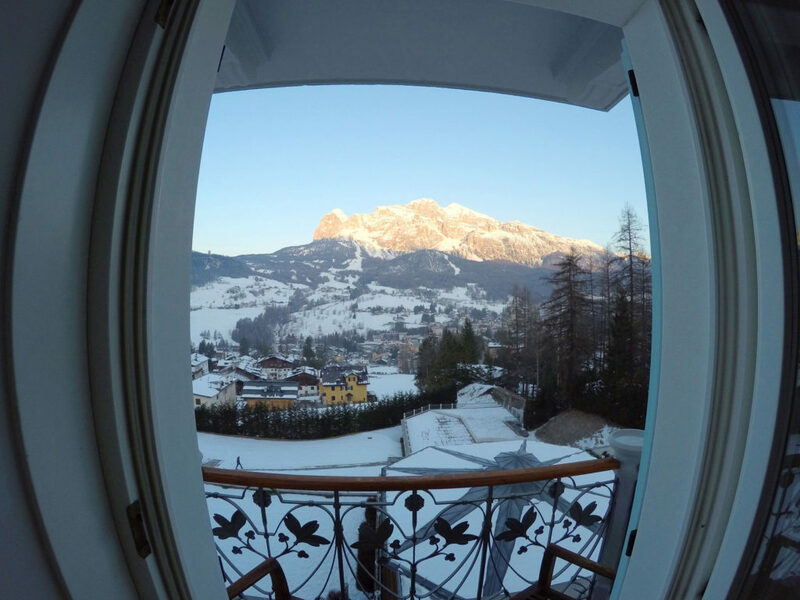 The Cristallo Hotel and Spa is the palace of Cortina, historic, perched on a hillside overlooking the village, with fine dining, a spa, a short drive (or hotel valet) to the slopes, with gorgeous rooms and suites, and stunning Dolomite views. 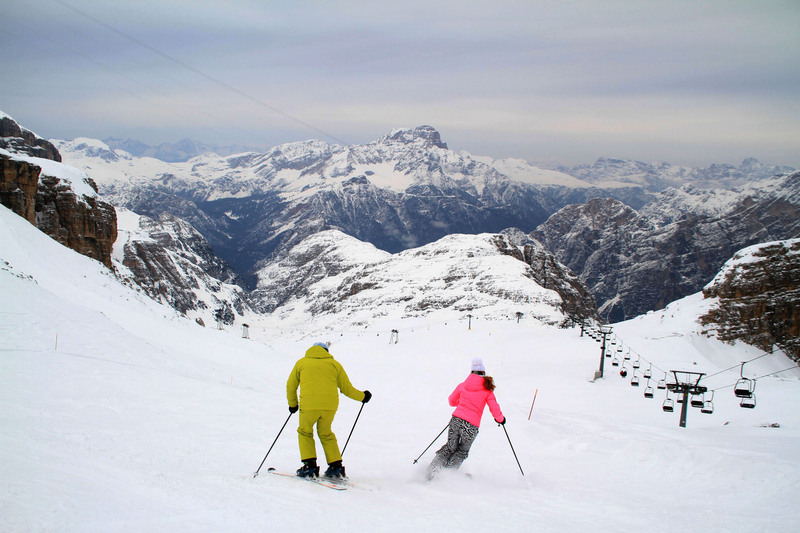 Faloria and Monte Cristallo are reached by Cable Car in town, the views are sensational and the dozen ski runs here, red and black, are well pitched and fun. 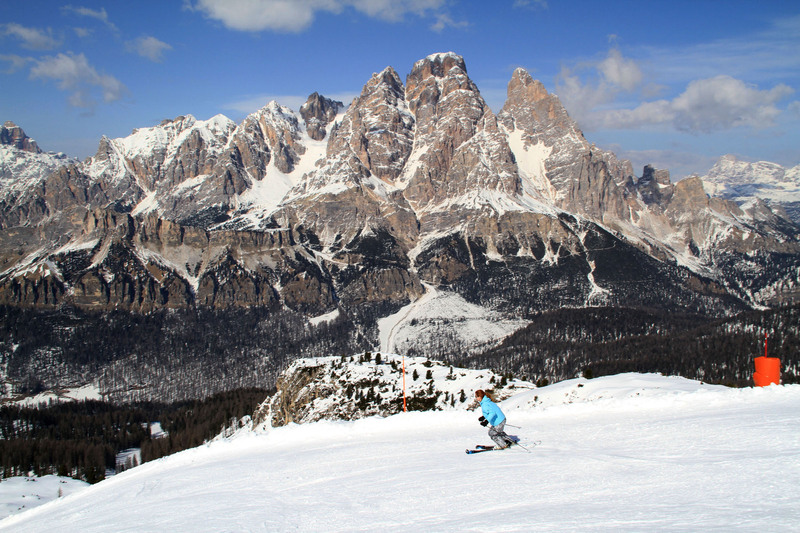 Skiing over to Monte Cristallo, there’s one incredible run from an old double chair, the Forcella Staunies, where you are surrounded by the red rock cliffs on both sides, more challenging but worth the view. 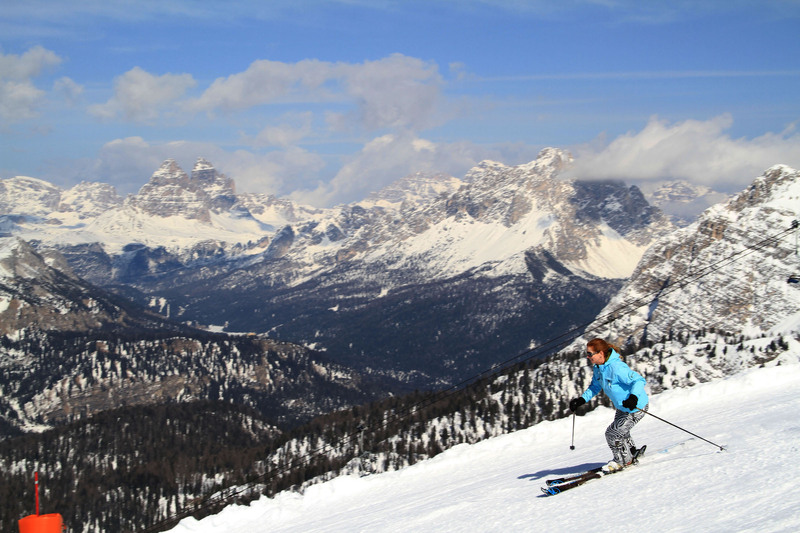 Tofana is to the south, with more ski terrain, trails with “emotion” and variation, including the women’s downhill – Olympia, where Alberto Tomba trained as a kid. 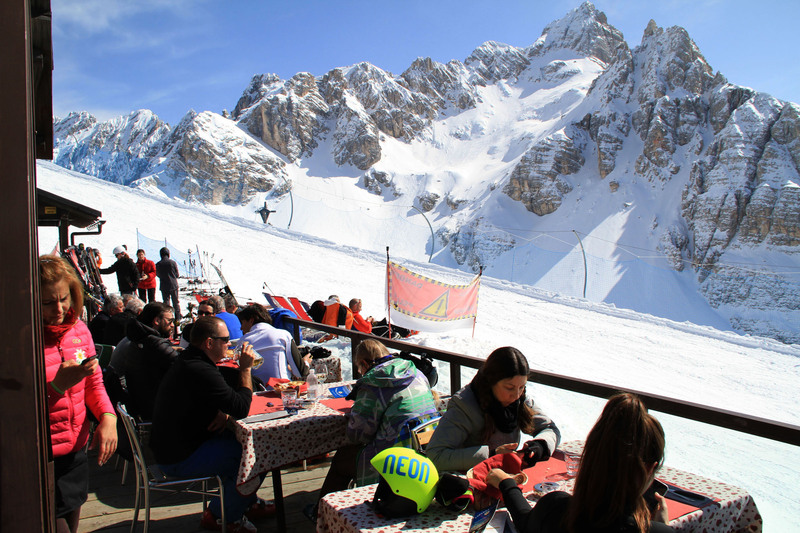 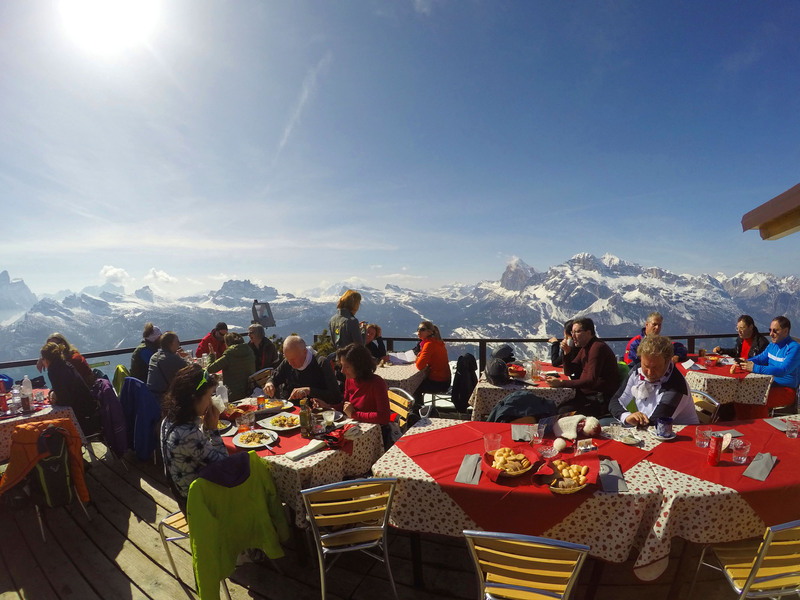 Tofana offers Cortina’s longest slopes surrounded by dramatic red rocks, reached by a two stage cable car to Col Druscie to Ra Valle, where there e is also a fantastic chalet for lunch. 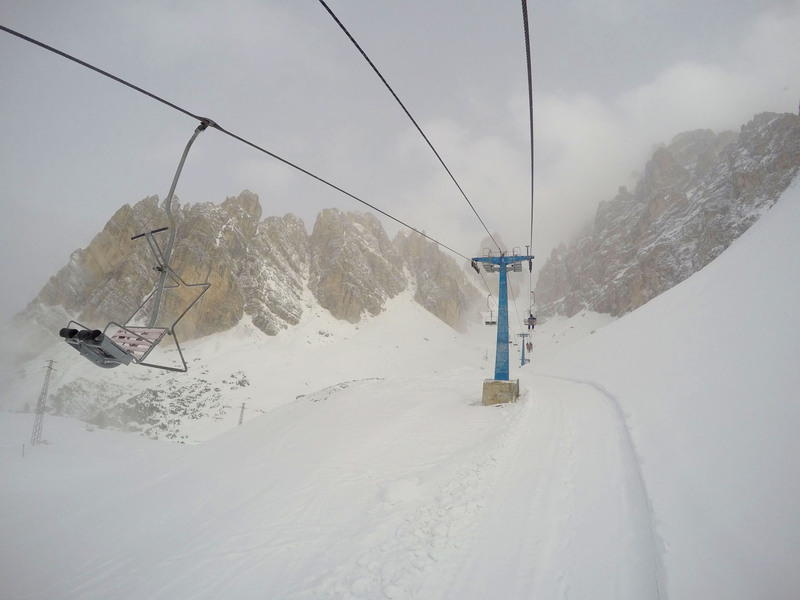 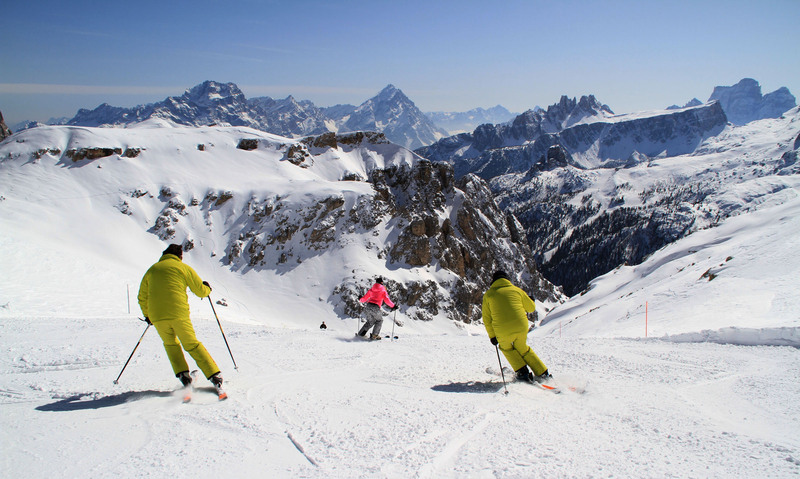 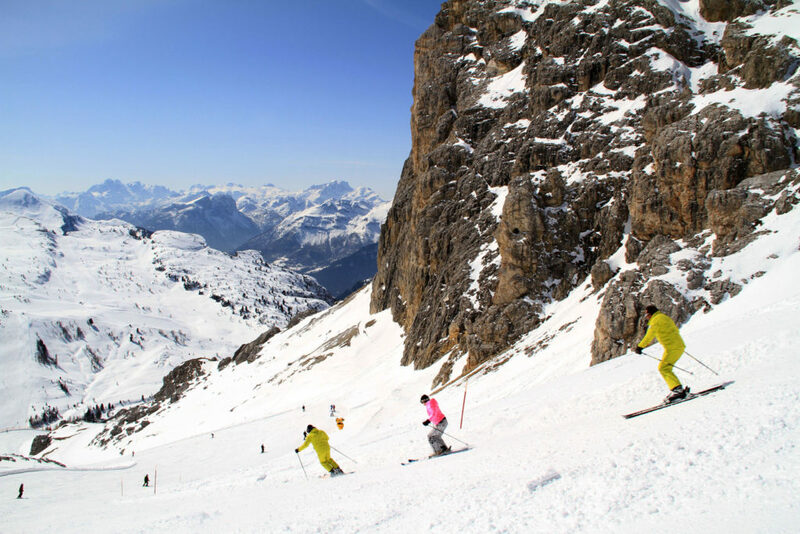 Cortina’s third ski area is Cinque Torri – named for the five towering peaks. 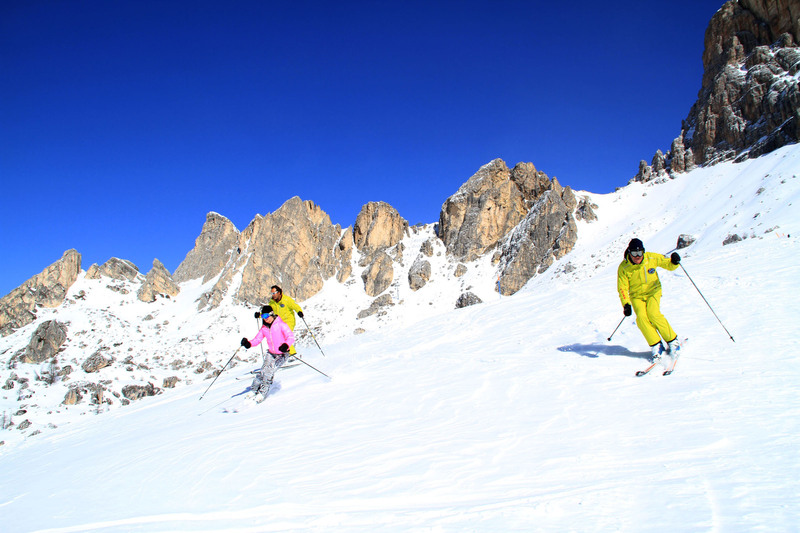 This south exposure skiing just beyond Tofano, offer a dozen mellow trails in the sun amid stunning rock towers. 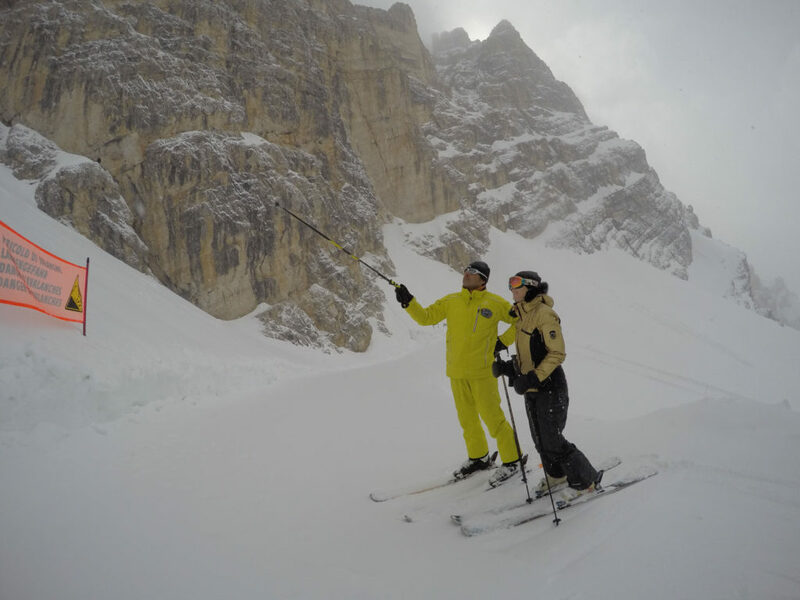 While you don’t necessarily need a ski guide, Cortina is confusing at first pass, with multiple names and regions. 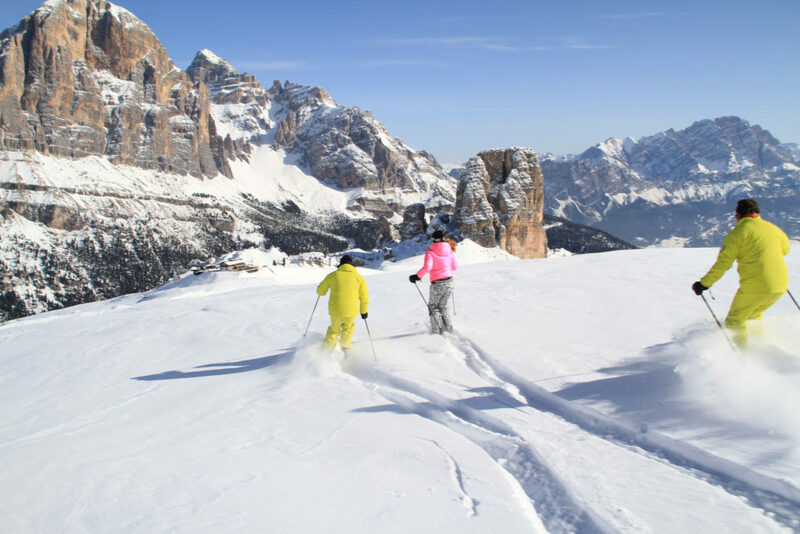 The Italians are friendly enough to answer your questions, or hire a ski instructor, or just explore by staying on the prepared pistes –since ther are rocks- dolomite – just beneath the snow. 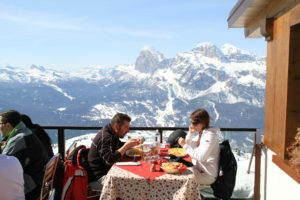 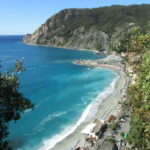 Stop at the beautiful mountainside chalets, or rifugios, for fantastic Italian food and wine with a view. See bunkers in the dolomite cliffs, an amazing reminder the war, and the Germans, Italians, Austrians, Russians, and Americans who fought here. 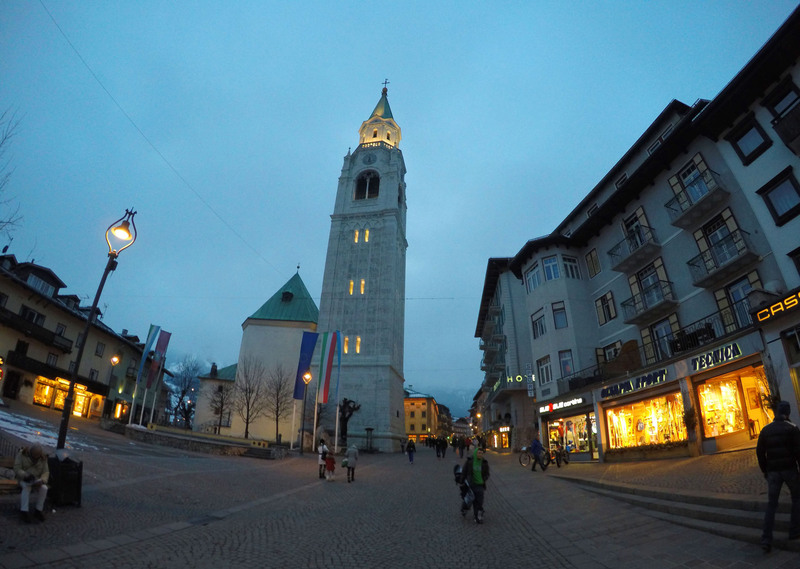 Cortina is the jewel or the pearl of the Dolomite ski region, and our favorite ski village. 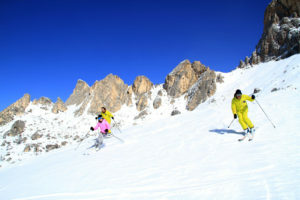 The scenery is fantastic, the town is very stylish and historic, skiing is a mere pastime. 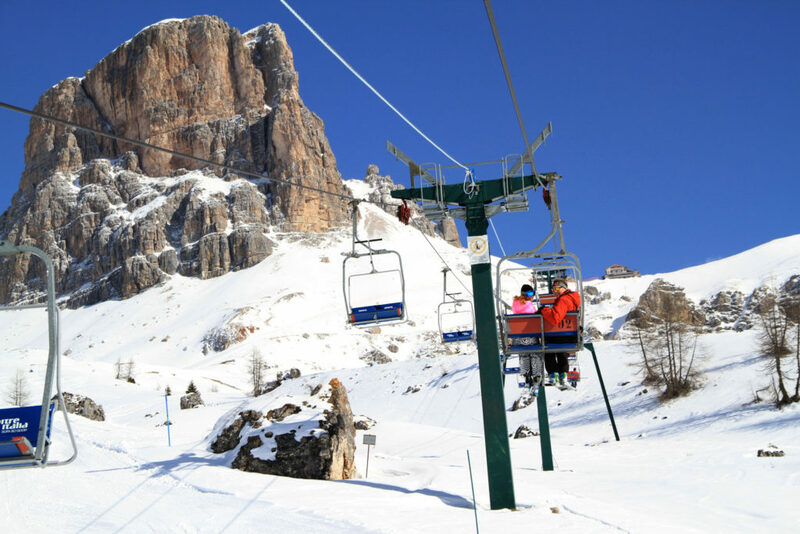 Cortina’s ski lifts are not as sophisticated as Austria or other Dolomite ski areas like Kronplatz and Val Gardena, but the clientele and the hotels and restaurants are.. this is the ski resort of celebs. 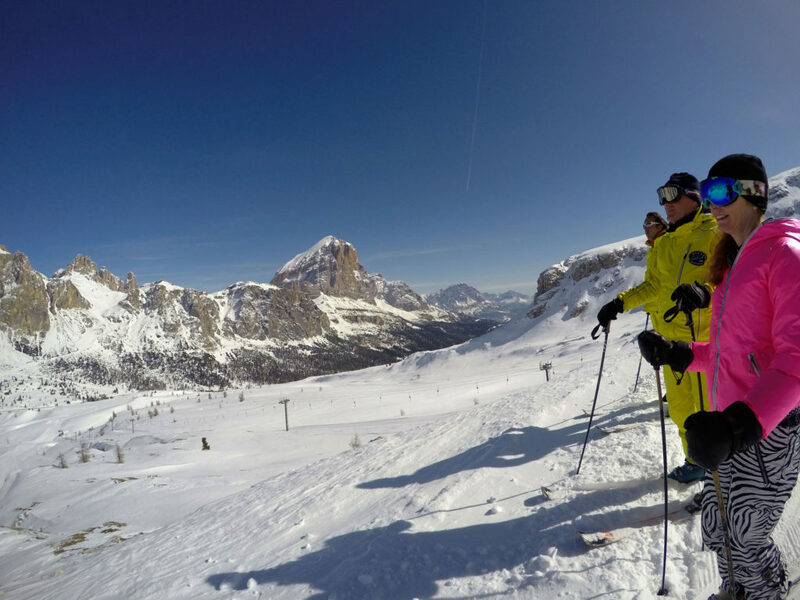 And you can always go explore the rest of the Dolomiti Super Ski Region (your lift ticket includes 12 areas, 450 lifts and 1200 kilometers of ski terrain). 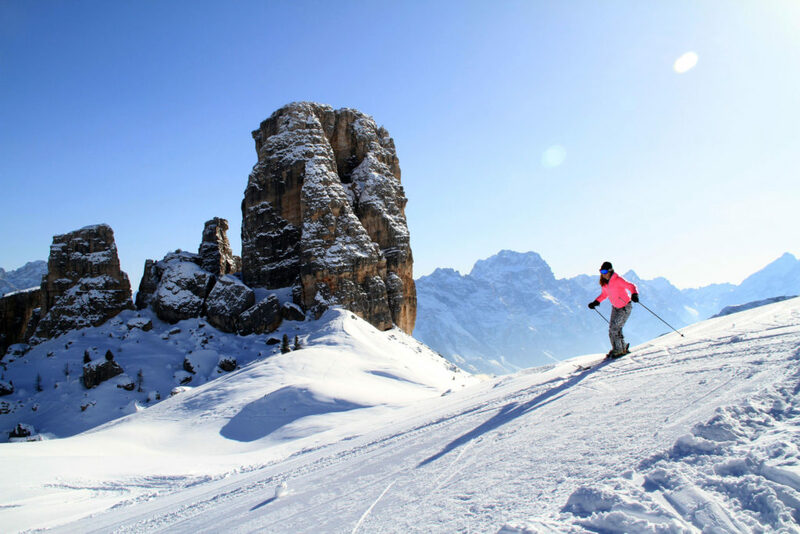 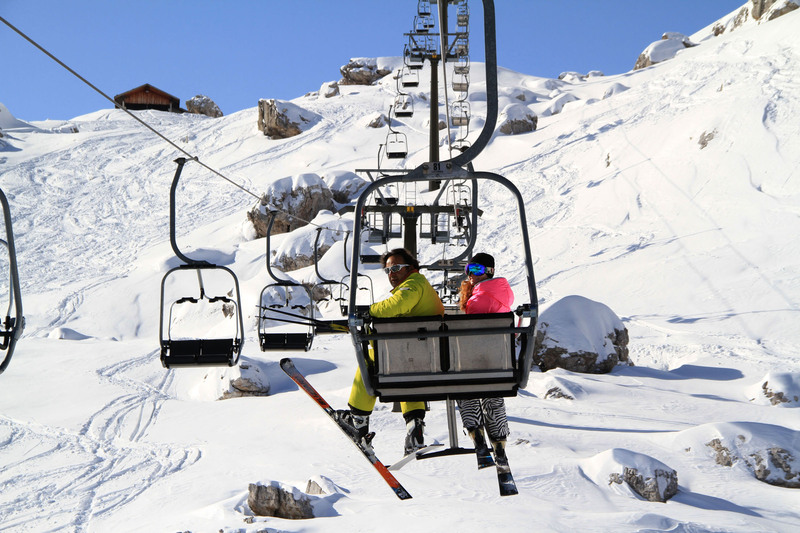 Put Cortina on your must ski Italy list, and bring your best ski attire and that Dolce Vita air.